Last year, I wrote a Take Five piece dedicated to Thelonious Monk Tribute Albums That Aren’t Terrible. Add Bobby Broom’s latest record, Plays For Monk, to that list. Raised in New York, Broom eventually settled in Chicago, where he’s now seen as a local luminary. Being Sonny Rollins’ guitarist will get you there, as will playing every Wednesday (when not on tour) with his trio at Pete Miller’s restaurant in Evanston, Ill. (“Good food, and great jazz,” Broom told me.) When I caught the band’s act in Washington, D.C., it was a remarkably tight unit, developing every solo into a deft narrative. Broom and company even played a Monk tune, “Light Blue,” which Broom had forgotten about when planning out the record — but one he calls “the essence of Monk’s harmonic irony, playfulness and mischief.” The considerate, interactive way the trio performed the tune, it showed. Many jazz artists also eschew the concept of applying jazz treatment to pop music, but Broom has made a career bucking that orthodoxy. Broom teams with Kobie Watkins (drums), and Philly native Ben Paterson (Hammond B-3 organ) to produce an eminently listenable new soul-jazz record of which stylistic progenitors like Wes Montgomery and Richard Groove Holmes would surely approve. 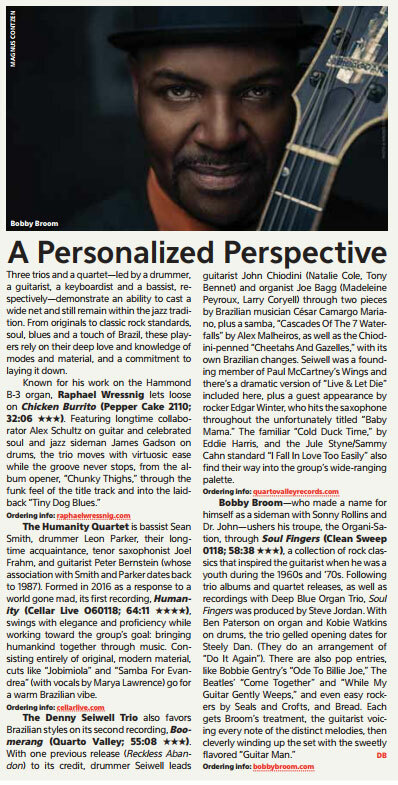 Coming together for the first time in 2014 as openers for Steely Dan, this trio, now rebranded as Bobby Broom and The Organi-Sation, hits its stride when the formal structure of each pop tune gives way to Broom’s intuitive and even-handed improvisation. Broom never strays too far outside the chord changes, and he doesn’t need to; the guys seem much more comfortable cultivating mood and groove than earning merit badges from the technical avant-garde. Paterson’s gospel-tinged organ permeates the cover of Procul Harum’s “A Whiter Shade of Pale;” a slightly slowed-down tempo amplifies the bittersweet, almost elegiac, quality of the original. “I Can’t Help It” is a cover of the Stevie Wonder-written tune from Michael Jackson’s Off the Wall, punctuated by an outro capturing what might qualify as Broom’s best solo work on the album… if it weren’t for two separate rip-roaring solos on “The Guitar Man.” It’s here where Paterson and Watkins lay all the way back and let Broom wade out to his improvisational edge. The most interesting tune on the album, though, is the trio’s take on Bobbi Gentry’s 1967 number-one hit, “Ode to Billie Joe.” Written in an unusual time signature (7/4), it’s this tune that, like dark matter, imperceptibly binds the whole together. Justefan Thomas’ solo on vibes halfway through feels like an unexpected treat on what is, from start to finish, the album’s funkiest groove. After hearing George Benson play Paul Desmondâ€™s â€œTake Fiveâ€ on his Bad Benson record, I was off on my personal journey of jazz discovery. I bought as many records as I possibly could within the budget of my allowance. That usually amounted to one or two records a week â€“ not bad for a fourteen year old. I began to make sense of the jazz idiom and language by connecting the dots between musicians on records, reading the liner notes from those records and casually investigating other written history of jazzâ€™s storied past. Learning about the big names in the music was a way of discovering what I liked as far as styles and categories were concerned. But regardless of a musicianâ€™s proposed jazz stature, their all-star associations, or their tainted reputation as a sell-out, the music always had the last say in determining what I liked. Itâ€™s interesting that on my journey I consistently landed on the islands of the clean-toned jazz guitarists rather than the distortion or other effects-laden six stringers who were certainly more in vogue during the 1970s. These cool jazz guitar sounds became some of my favorite getaways. When asked to pick five recordings by jazz guitarists that had the most profound effect on me during my formative years, the first that comes to mind is George Bensonâ€™s Breezinâ€™. I had become familiar with Benson when I finally decided to look into jazz after hearing crossover hits by Herbie Hancock and Grover Washington, Jr. In fact, as stated earlier, hearing Benson was what set the jazz wheels in motion for me. Around two years had passed between the beginning and Iâ€™d become â€œhipâ€ to Charlie Parker, Dizzy, Miles, Wes, Coltrane and many of their colleagues. I was enamored with and ever changed by modern, straight ahead jazz; but when I heard Breezinâ€™ I was elated! The jazz guitarist had done exactly what Herbie and Grover had done in creating a crossover, jazz/pop hit; but not only that, heâ€™d managed to play some of the most compelling jazz guitar ever recorded while doing so. I didn’t care to think about whether it was jazz or not. No funky backbeat from Harvey Mason’s drums, thumpin’ electric bass, keyboards or strings can erase the creativity of George’s ideas on the changes of â€œAffirmationâ€ and â€œSo This Is Love,â€ or his fire and dead on technique on â€œSix to Four.â€ I didnâ€™t know what to do first, groove along or get busy trying to figure out what he was playing on those songs! The fact that Breezin’ is great jazz was never in doubt to me, and the possibility that it could also be popular was an exciting bonus for this kid in bell-bottoms. My other hero at the time was Pat Martino, the six-string slinger from Philly. When I heard his version of â€œSunnyâ€ from his live recording I was lying in my bed in agonizing pain awaiting a hernia operation the next day. But by mid-solo I had to find a way over to my stereo to turn up whoever that was! After that I was forever a Martino fan. The record that epitomizes his power for me is his We’ll Be Together Again, a duet with pianist Gil Goldstein on Fender Rhodes. It was released in 1976, the same year as Breezin’ and couldn’t have been more different. The first tune, a suite in three movements, is chockful of music that was way above my head at the time. So I just listened to the rest of the record, which was full of beautifully haunting versions of standard tunes. While writing this piece I revisited that first tune on the record, â€œOpen Road.â€ I didnâ€™t know what I was missing! It struck me that this composition is a comprehensive example of all of the best of Martinoâ€™s musical attributes at their height. The vibe that record has is due to the instrumentation, the duoâ€™s interaction, the recording quality and Pat’s superior playing. On each tune he first makes the ultimate statement by playing the melody with the accuracy and nuance of a master. He goes on in his solos to dissect the progression of chords, playing one idea after another but never repeating himself. He had the perfect balance of technique, subtlety, authority, and sensitivity. In 1976 Pat and George gave super-power to the art of jazz guitar. They were the kings of that era. I’m sure Wes Montgomery would’ve been proud. Montgomery set the stage for 1970s jazz guitarists and future generations to come with the groundwork he laid in the sixties. He made sophisticated and swinging records with his organ trio in the late fifties and early sixties where he introduced two revolutionary approaches to the instrument in playing melodic lines either in octaves or bolstered by chords. Wes would use these techniques flawlessly during his solos as well, without at all diminishing the content of his improvisations. And so, during the first two-thirds of his recording career Montgomery further documented the fact that the highest level of jazz could also be achieved on the guitar. In the mid-sixties he teamed with the Wynton Kelly Trio and various other jazz luminaries to record, ply his craft and further establish his hierarchy in the jazz world. My first encounter with Wesâ€™ music was on a live album from 1969 called Willow Weep For Me, which tracks would later be included on the favorite Smoking at the Half Note sessions with the Wynton Kelly Trio. Wes was in full bloom here, blowing and swinging hard and stamping his trademark on every tune. In the late sixties Wes signed with Verve Records (and later A&M) and producer Creed Taylor. Together they formulated a template for his commercial success. Playing popular songs, exploiting the use of his trademark and distinctive octaves, employing string sections and integrating the improvised solo more within the framework of the whole arrangement, became elements of Wesâ€™ A&M recordings which would make him popular beyond jazz circles. My favorite of these later records is Bumpinâ€™ from 1965. Out of eleven tunes it contains only three standards: â€œCon Alma,â€ â€œThe Shadow of Your Smileâ€ and â€œHereâ€™s That Rainy Day,â€ each one heavily arranged by Don Sebesky. You wonâ€™t hear Wes play any burning solos on these tracks. (For just one example of that, see â€œDearly Belovedâ€ on his Riverside release, Boss Guitar.) On Bumpinâ€™ there are his gorgeous sounding octaves playing the melodies and his captivating chord solos announcing the last of the â€œthree tiersâ€ of his perfectly constructed solos, after the single lines, then octaves. Wes made some beautiful music for listening on the Verve and A&M records. Although they were not â€œblowing sessionsâ€ (a moniker for records in which jazz musicians display their mastery via extensive soloing), his musicality was as intact as ever as he embraced the role of artist, painting his fully developed style through the canvases that Sebesky and company had created. Additionally, he introduced the sound of the jazz guitar to the general public by entering their lives through the airwaves, while also making it safe for future jazz guitarists to explore beyond the boundaries of what is thought of as jazz purity. Two current-day jazz guitar heroes come to mind and must be included on this list of guitar records that informed my stylistic direction. Pat Metheny and John Scofield both came to the fore during the 1980s. Scofield first came to my attention through his work with jazz-fusion pioneers (drummer) Billy Cobham and (keyboard player) George Dukeâ€™s, Cobham/Duke Band. By his 1980 trio recording, Bar Talk, his playing style was matured and displayed via his flourishing compositional skills. What intrigued me about this record was Johnâ€™s clear grasp of and respect for the jazz guitar tradition, which he seemed to integrate with an honestly chosen gritty tone, which hints at blues and rock guitar styles. His jazz vocabulary, fanciful improvising on chord changes and use of octaves and chords, combined with his biting tone and bluesy bends and wails, all on glorious display on this record, would eventually capture a legion of fans while inspiring a new generation of wannabe jazz guitarists. John Scofieldâ€™s Bar Talk is one of my personal favorites. Pat Metheny is arguably one of modern-day jazzâ€™s most popular guitarists. He has certainly taken advantage of the extraordinary opportunity to perform and record that he has been given over the past thirty years. I first heard of Pat as a result of his 1976 trio record, Bright Sized Life, with bassist Jaco Pastorius. But I became a fan with his 1982 release, Off Ramp. This record became an instant classic with its radio hit, â€œAre You Going With Me?,â€ which was a total anomaly, having no actual melody, but just a hook-like chordal vamp. On this tuneâ€™s extended guitar solo, Pat introduced his guitar/synthesized trumpet-like sound, which would be one of his trademarks for years to come. Metheny, like Scofield is a prolific composer and has used this gift as an impetus for growth as a jazz guitar player over the course of years. In fact for me, and I suspect many listeners of Off Ramp, the attraction was as much about the songs as it was Methenyâ€™s then still developing playing style. He would continue to grow as a jazz guitarist while taking thousands of fans along for the ride. Pat, like all the other players mentioned here, inspired jazz guitarists to dream, practice and imagine and develop.